complete package: beautiful sandals that are safe and comfortable. What if they get dirty or smudged? No problem. With a damp cloth, they will be clean again in no time! have continued to build the company along with the passion and integrity of our dedicated staff. CUTE AND COMFORTABLE: Shimmering straps with glitter for added shine in pink or silver. Great choice to keep busy feet fresh and active. The perfect complement to a summer outfit! A "DON'T THINK TWICE" PRICE: Affordable shoes and good quality, a smart solution for the fast growing feet of your little princess! Available in whole and half sizes. 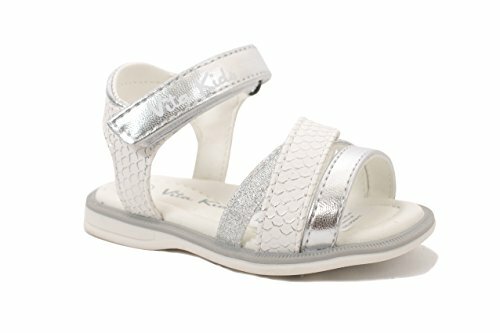 Your girl will fit right in with her Vita Kids sandals! EASY ON AND OFF, EASY CLEANING: Adjustable velcro strap closure for an easy on and off. With a damp cloth, they will be clean again in no time! If you have any questions about this product by Vita Kids, contact us by completing and submitting the form below. If you are looking for a specif part number, please include it with your message.